Here we’ll post hexagonal findings from around the city, nooks and crannies where honeybees have left their cultural marks, and reflections in the design choices of human beeings. We’d be happy to feature your own sitings if you share them with us! Polarized light mural at Museum of Science! Took a trip back to NYC last weekend to check out some of the art fairs. Of course the vibe was very different from the playful/pedagogical context of Systems: ECOnomies, where the beehive is currently on display, but the bees still left their mark. This image features a gorgeous necklace made by visual artist Miguel Ovalle who exhibited at Fountain. Later we took a stroll down to SOHO to check out Anthony Greaney’s show at Zürcher. Grabbing some coffee down the street, we spotted a lovely hexa-pocked ceiling! 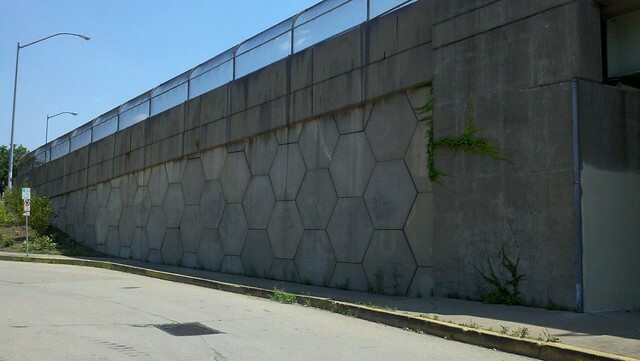 Urban Hex #5: Bees Under Bloomfield Bridge? 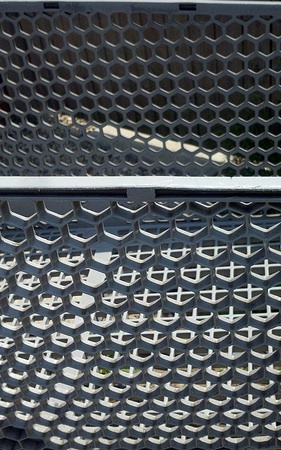 Found a nice honeycomb pattern along the Bloomfield Bridge in Pittsburgh. 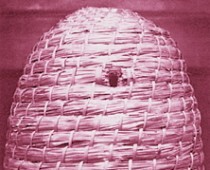 Urban Hex #4: The Beerhive! When a friend and I were separated during my stay in Pittsburgh, naturally he guessed I’d found a cozy spot in the Beerhive. Unfortunately I didn’t get to experience this joint, but managed to get a photo before we found one another. Urban Hex #3: Bee Heard! Snapped a photo of this find in Harvard Square. A new addition to the Urban Hex collection. 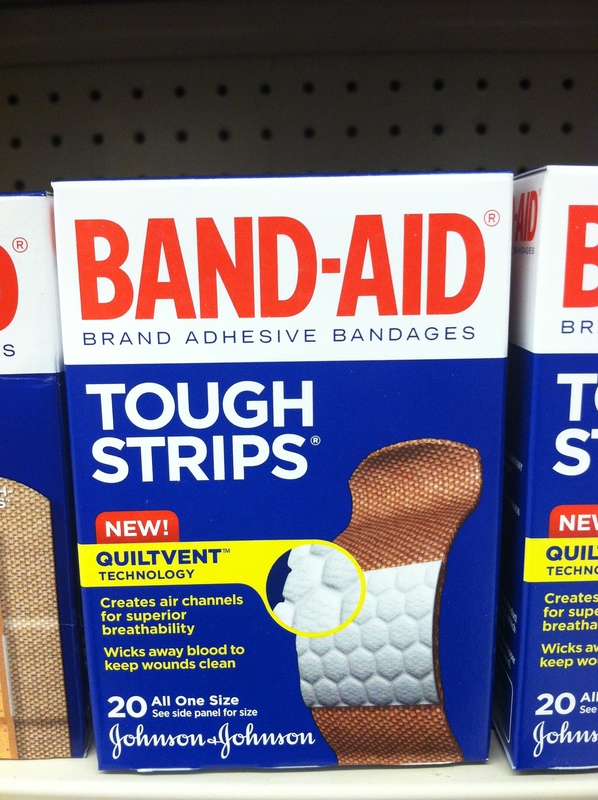 Along the isles of a pharmacy, we now find hexagonal quilted band-aids! Perhaps the power of the hex will prove to repair as well as honey. Instead of Neosporin dress your wound with honey beneath the bandage. While it keeps the skin moist (which is the best atmospheres for skin to heal) it also is an antiseptic so you won’t find bacteria growing on your wound. We find kids won’t object to rubbing a little honey on their wounds and they’ll often crack a smile at the thought through their tears. 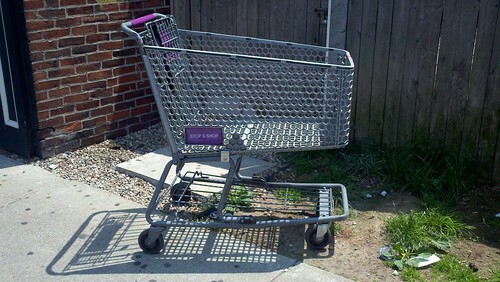 Found this beauty sitting on a corner in Southie after a lovely Memorial Day brunch.